Increased lethargy could indicate liver cancer. Although it can be a devastating diagnosis for owners to hear, liver cancer in cats isn't always fatal. Because the liver is a fundamental organ that is responsible for the detoxification of the animal's blood, a liver tumor is a very serious health problem. However, in some cases, the tumor can be treated. Successful treatment depends largely on the precise diagnosis. Liver cancer manifests itself in cats in three types, all of which involve tumors that are found in the liver. The first type of tumor is called the metastatic tumor. These tumors actually spread to the liver from other parts of the body. The second tumor type is labeled as hemolymphatic. This name is derived from "hemo" (blood) and "lymphatic" (indicates the lymph system). Hemolymphatic tumors arrive in the liver from blood and lymph sources. Lastly, primary tumors are labeled as those which actually originate in the liver. Primary tumors are very interesting in that they are believed to be caused by environmental toxins. Anything from chemical cleaners in your home to chemical preservatives in your cat's food could be considered potential causes for primary liver tumors. 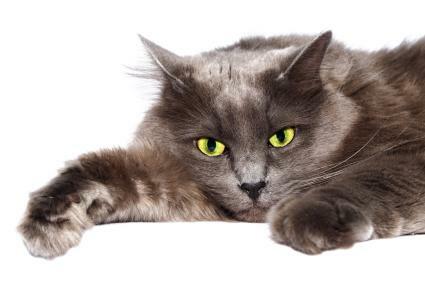 Feline liver cancer produces symptoms that can mimic many other cat diseases. It is unlikely that pet owners will notice an increased lethargy in their felines or automatically arrive at the diagnosis of cancer. More often than not, pet owners will notice strange behavior in their cats which will prompt a vet visit. These general yet concerning symptoms may not reveal much during a blood draw. A CAT scan or an X-ray will be taken. Visual tests can reveal the liver tumor(s), and this information will lead the vet to a diagnosis of liver cancer. If liver cancer is advanced, there are some symptoms that will place this potential diagnosis high on the list. Swollen abdomens are not uncommon to diseases such as cancer, feline infectious peritonitis and others, but if this symptom is accompanied by jaundice, fatigue, weight loss, dehydration and vomiting, liver involvement is indicated. Treatment options do vary depending on the specific type of liver cancer. However, most cases will initially be treated by surgically removing the tumors. The good news regarding liver cancer is that almost half of this organ can removed without any significant detriment to the animal. The liver regenerates. If the tumors are not too plentiful, most cats will respond well to their surgery. Surgery is the most common option because hemolymphatic liver tumors cannot be treated by chemotherapy. Chemotherapy is also extremely harsh on the cat's system and may result in a permanently weakened state. This treatment also lowers the cat's immunity which can lead to chronic infections, gastrointestinal symptoms such as vomiting and diarrhea, and even bone marrow problems. Without a doubt, liver cancer that can be treated without chemotherapy provides a far more desirable prognosis. If your cat has ever suffered from liver cancer, it should be noted that there are preventative lifestyle measures that may greatly affect whether your cat will suffer from a future bout of this disease. The fact that primary liver cancer is influenced by environmental factors alerts pet owners to the need for a clean, low-toxin lifestyle. Pet foods should not contain chemical additives and foods should be fresh and organic when possible. Also, eliminating the use of chemical cleaners within your home will lower the chances of your cat inhaling these toxins into its system. Of course, this advice isn't cancer specific. All animals can benefit from healthy dietary choices and a low-toxin lifestyle.